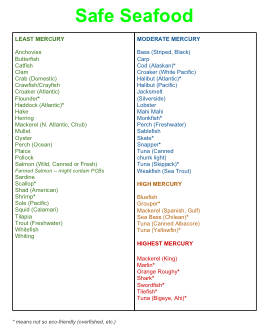 Wondering which fish and seafood species are lowest and highest in mercury? Here’s a one-page printable chart suitable for hanging on your fridge or tucking in with your shopping list. I put this together based on information I gathered from the NRDC website. Great list, next time i will be careful in selection. Thanks for sharing. VERY MUCH APPRECIATE YOUR EFFORTS! This is helpful but I wonder what is a low level of mercury? Is any amount of mercury acceptable. I love fish but I’m reluctant to eat any because of all the mercury levels. Is tuna now on the don’t eat list? Is a certain amount of mercury naturally present?